RIO DE JANEIRO, BRAZIL – At 6AM on a Monday morning, while most are enjoying their last hour of sleep before the weekday begins, Rogerio Rodrigues is on the sidewalk that straddles the Praia de São Conrado even before the traffic begins to choke Avenida Niemeyer as it winds its way into Leblon. He is coaching Carlson Barros through a series of animal walks and crawls – the jacaré (alligator), siri (crab), and pato (duck) all make appearances. Rogerio Rodrigues coaches Carlson Barros through warm-ups, photo by Gregory Scruggs. Soon after, he sends Carlson, 29, to fill a nylon sack with sand, who fetches it from the beach, returns, and begins a series of lifting repetitions like a gardener hauling sacks of soil. For Rodrigues, 30, imitating nature and acts of manual labor is the genius of CrossFit, a global fitness movement that avoids the artificial postures of mainstream gym culture to focus on natural movement that breaks a sweat and builds conditioning. Codified by former gymnast Greg Glassman in California during the 1970s, CrossFit came to Rio in late 2008 at the hands of Chris Clark, a former volunteer with the Instituto Dois Irmãos, where Rodrigues also serves as volunteer coordinator. A long-time boxer, Rodrigues was attracted to the CrossFit routine and resolved to continue training even after Clark’s departure. Rogerio Rodrigues times Carlson Barros during the WOD (Workout of the Day), photo by Gregory Scruggs. Short sprints, squats, push-ups, sit-ups, and dead weight lifting all regularly feature in the Workout of the Day (WOD), the centerpiece of any CrossFit session. Carlson huffs and puffs his way through repetitions with the sack of sand as the traffic begins to pile up on Niemeyer. Rodrigues coaches him with a stopwatch in an enthusiastic and encouraging fashion, a far cry from the “boot camp” trend of fitness training where trainers motivate by verbally pressuring their trainees. That said, police academies, military training centers, and SWAT teams are all known devotees of the CrossFit training regimen. As for the fact that Rocinha CrossFit is based in Rio’s largest favela, where Rogerio was born and raised, it is a point of pride for him. “We are the only CrossFit affiliate in a community like this and the response is so positive,” Rodrigues proffers, pointing to a t-shirt from CrossFit Denmark. Rodrigues hopes to train other coaches from within the community in the near future, especially given how busy his schedule is with clients. “Rocinha has problems with education, violence, and drugs,” he points out, “and CrossFit offers mental training as well. My mission is social inclusion. My vision is that one day Rocinha will send a champion to the CrossFit Games [an annual competition among CrossFit athletes].” An hour a day with Rogerio and that should be a breeze. Rocinha CrossFit sessions begin at an hour for newcomers and extend to 90 minutes for regulars, at a cost of R$30 each (monthly packages are available). Thanks for capturing so well what Rocinha CrossFit is all about, Greg! I thank all the Rio Times’ readers for taking their time to read this story and I hope you will take the time to enter in contact with me. 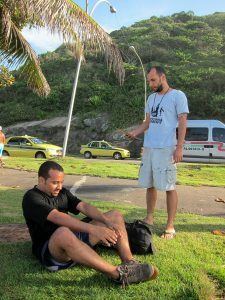 Great article; I recently had the honor of training with Rogerio while on business from the US. Having been training in Crossfit for a bit over a year and having the benefit of access to decent equipment I thought I would be able to hold my own, which I think I accomplished however; Rogerio’s knowledge definitely exposed some of my weaknesses, areas of ignorance and highlighted some changes I needed to make to my programming. On top of that he was hospitable, friendly, and inviting. I believe that Crossfit Rocinha is on a great path with an excellent mission and excellent trainer, I look forward to the next opportunity I have to visit and more so to contributing what I can to assist in its goals. It’s a dream of mine to come back to my mother land and train with Rocinha Crossfit. I admire the vision and the sense of mission to the underprivileged. Rocinha brings so much good and helps people hope in themselves and dream of possibilities of a better life. It’s a sort of new samba to the soul. I too had the privilege of training with the “Rogster” and appreciate very much his work in Rocinha as much as his being there for my workout. Equipment is very expensive there, so he has done a great job in working with what he has so that these kids can get out of the legacy they are I. Thanks, Rogerio.